Just in time for the World Cup, Sports Illustrated is expanding its soccer blog, Planet Futbol, into a stand-alone site set to roll out later this week. SI made a similar (and very successful) move last year when it launched MMQB, a spinoff site based on football writer Peter King’s popular Monday Morning Quarterback blog. PlanetFutbol.com will also be led by one of SI’s star writers, Grant Wahl, who has overseen the Planet Futbol blog since its launch last September. About a dozen other SI staffers and regular contributors will write for Planet Futbol, including both full-time soccer writers (like Brian Strauss, U.K.-based Ben Lyttleton and Brazil-based James Young) and a few of SI’s soccer fanatics who haven’t previously covered the sport for the publication. 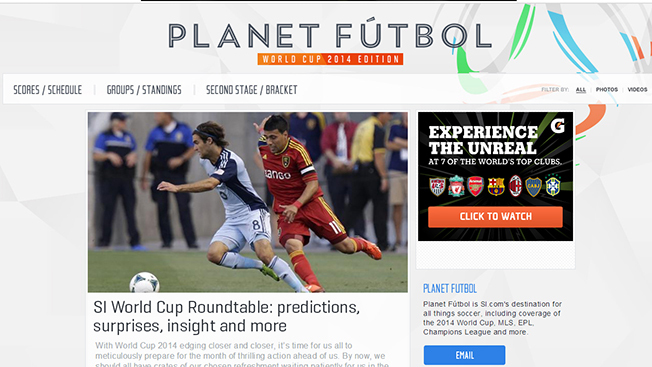 Since its launch in 2013, the Planet Futbol blog has seen significant growth, with traffic up 230 percent and pageviews up 400 percent, according to the company. The new stand-alone site has signed advertising partners including Degree, Edge Shave Gel, Hublot, Canon and Gatorade.